How does the world make sense of unimaginable atrocities and establish some semblance of justice for those affected by these events? 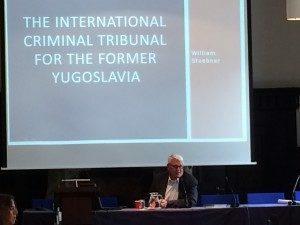 On Wednesday, Former Special Advisor to the Prosecutor for the International Criminal Tribunal for the former Yugoslavia (ICTY), William Stuebner, provided rich insights into the events that led to the development of the ICTY. The Tribunal was established as a United Nations court of law dealing with war crimes that took place during the 1990s in the Former Yugoslavia. As someone who has admittedly spent little time in studying the history of this area of the world, I found Mr. Stuebner’s lecture incredibly informative. Not only did I gain information that helped me understand the empirical realities on the ground, but also the normative issues involved. Mr. Stuebner provided IPSI participants with detailed recollections of the nature of the conflict and the history of the people involved. While participants received a wealth of fundamental information, Mr. Stuebner brought the issues to life with his personal anecdotes. Having had a career in the military before working with non-governmental organizations in the field, Mr. Stuebner elucidated the complexities of warfare and providing humanitarian assistance. Perhaps one of the most salient takeaways from Mr. Stuebner’s lecture was that understanding the historical context of violence is essential in not only ending a conflict, but also ensuring that the violence does not recur. His explanation of the evolution of political power, even through the creation and recreation of nationalistic symbols, was helpful in understanding how the crimes of the 1990s came about. I had always found it difficult to differentiate the ethnic and religious groups in this area of the world, but during the lecture, I realized that I was justified in my confusion. The difficulty in following the complex political history of this area is something to keep in mind with regards to the peace process, including truth telling and reconciliation. I found myself asking how I might go about initiating the process of bringing peace to a place where divisions based on ethnic and national identity had been subject to multiple upheavals and systemic violence. While I have not yet come up with an answer to this question, I believe it is important to keep in mind, not only with regards to negotiating peace agreements, but in holding those responsible for the violence accountable for their actions. Another major takeaway from Mr. Stuebner’s lecture addressed the nature of seeking justice and achieving peace in the aftermath of political violence. The process of pursing justice for mass atrocities is arduous, to say the least. 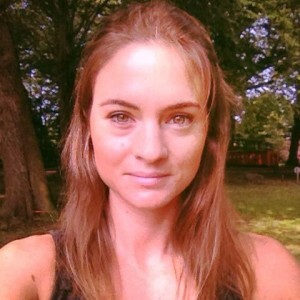 In the case of ad hoc tribunals, such as the ICTY, the tasks of gathering a team, establishing headquarters, and beginning the process of investigation are laborious and rife with difficulties. While from the outside, it may be easy to criticize the inadequacies of ad hoc international tribunals, the reality is that the successes that come from these institutions do contribute to a movement toward peace and resolution for those affected by the crimes. One may also argue that full justice is not served through the processes and outcomes of the courts. However, it is important to keep in mind that the ad hoc courts provide a means to begin the process of holding the accused accountable when domestic institutions simply cannot deal with such proceedings, whether because of lack of credibility or lack of capacity. At the end of the day, I felt as though I had absorbed the information of several books regarding the subject of the ICTY and the history of the Former Yugoslavia. But more than simply a fact-gathering opportunity, attending William Stuebner’s lecture felt more like peering into a window of the past, overhearing the dialogue between members of a world that, before today, seemed so distant from my own. Mr. Stuebner humanized the war in the Former Yugoslavia, gave faces, personalities, and lives to the anonymous victims that put so much hope in the outcomes of the ICTY. Through his humor and solemn recollections, Mr. Stuebner illustrated that, while it possesses flaws (as with any experimental institution), the ICTY serves as a tool for justice as well as a reminder to the world that what happened in the Former Yugoslavia will not go unaccounted for, nor will it be forgotten.